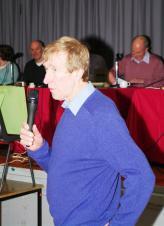 The 37th Keyworth Quiz got off to a fine start on 30th January. The event was opened by past question master Brian Lund, who gave a very humourous précis of the success of the quiz over the years, and reminded the audience of the Top of the Pops from some of the years gone by. Brian also recounted that it was the anniversary of the execution of King Charles 1 in 1649 (that must be a useful fact for future quizzes), but thankfully no one lost their heads in the opening matches. In front of a very full audience, Keyworth United CFC showed why they had reached the semi finals last year with a very impressive opening win and there were also successes for the Scouts Parents, Keyworth Primary School and the Four Feathers. Despite treacherous conditions outside, a very brave crowd made it to the second week of matches and they were rewarded with some very close games. There were wins for the Scouts – Uniformed Branch, Methodist Church, Twinning Association and the Keyworth Medical Practice. There was also a momentous win for the Probus team who played superbly to edge out last year's champions, the Scouts Turkey Trotters. The third week of games saw some excellent performances from the BGS team, the Keyworth U3A and the runners-up for the past two years, the Parish Church. Audience favourites, however, were definitely the Year 12 students from South Wolds and their team of Harriet, Harry, Joe and Elizabeth raised everyone's spirits with a great effort against the very experienced Local History Society, going down by just five points. It's often said that the Village Quiz needs younger players and we hope that these very bright teenagers will come back and play again in future years. The second round started on 27th Februaryand one of Keyworth's fastest growing associations, U3A, played a tremendous game to defeat the very strong Parish Church team who have been finalists for the last two years. A large crowd also saw wins for Keyworth Primary School, the Twinning Association and the Local History Society, who all claimed quarter final places. The second round was completed on 5th March and the audience were treated to some nail-biting finishes. The opening game saw the experienced Rugby Club team just prevail over Probus by four points. The next game was even closer as a titanic clash between the Methodist Church and Keyworth Dramatic Society ended in a 56 points all draw. This means "extra time" of five additional bell and buzzer questions and, after four extra questions, the scores were still tied. With sudden death "penalties" looming, the Dramatic Society just got in ahead on the buzzer to the question "sunlight is the primary source from which humans receive which vitamin?" to clinch the match. To see the answer which won the day for our Dramatic Society please scroll to the end of this article !! After a well deserved refreshment break, the Scouts Uniformed Branch played superbly against the seven times quiz champion BGS team, being very unlucky to lose by just three points, and the evening was completed with a good performance from the "ex" badminton players of the Four Feathers to defeat recent champions Crossdale Drive School. The four quarter finals were played on 19th March, and all of the matches were very close right up to the end. Keyworth Primary School and the Four Feathers were level with just three questions remaining on the bell and buzzers, with the Feathers just getting in ahead to clinch their semi final berth. The BGS team, with a great history in the quiz, needed all of their experience to overcome the Keyworth U3A side who had impressed everyone with their performances in the first two rounds. The audience were then treated to a titanic clash between the Rugby Club and the Twinning Association, who have no less than ten cup wins between them, and, on this occasion, it was the Twinning team who just got their noses in front. The last of the quarter finals provided another cliffhanger in the battle of "societies" as the Local History team were caught and passed by the Dramatic team who had an inspired late run of answers – some of the team were excused rehearsals for "in for the kill" and they certainly showed a killer instinct in the final round! Now we're preparing for the Finals night on Monday, 26th March in the Village Hall, starting at 7.30pm. Both semi finals and the Grand Final will be held on that evening, so come along for a great night out, meet up with old friends, win some choccies in the audience quiz and hopefully be well entertained. The Village quiz organisers are always up for a challenge and, this year, on the day before our Grand Final, our lovely scoring ladies and our question setters intend to take part in Sport Relief to try and help others less fortunate than ourselves. We're all going to enter the 'Sport Relief Mile'; in fact the ladies are talking of entering the three mile event and our fairly geriatric question setters are entering the six mile race, all to raise money for a great charity. If you would like to sponsor any or all of our team, please contact the number below. Despite its success, the Village Quiz is in danger of dying, as no one has come forward to act as question master for 2013. The excellent scoring ladies and our technical wizard will all be available to help whoever takes on the role – but we do need a new question master. The present team will all be very happy to guide new presenters along to ease them into the quiz. The Village Quiz is a fairly unique event which is always very well supported, and its continuity should be encouraged. Did you know its Vitamin D which we get from sunlight? XHTML 1.0 validated. WCAG compliant. Page generated in 0.1384 seconds.